The biggest electronic health record company made plenty of big news this past year, beginning with the scoop that it would develop new technology aimed at smaller hospitals. 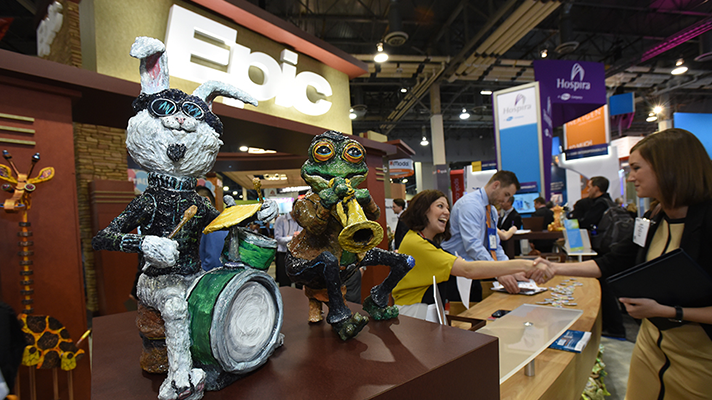 "We're developing some really nifty new software," Epic founder and CEO Judy Faulkner told Healthcare IT News at HIMSS17 in Orlando this past February. "We're finding that people need different things," said Faulkner. "If you are a critical access hospital, you don't need the full Epic. The two new versions of Epic in development can provide a pathway to adding all the features at a later time." Earlier this month, Epic announced that Sonnet would be available starting in March. "Because healthcare is now focusing on keeping people well rather than reacting to illness, we are focusing on factors outside the traditional walls," Faulkner told Healthcare IT News. "'E' has to go away now. It's all electronic," Faulkner said at the company's user group meeting in late September 2017. "We have to knock the walls down whether they're the walls of the hospital or the walls of the clinic." As she sees it, the 'E' should be replaced with a 'C,' for "comprehensive." A want ad popped up on the Epic Systems website, looking for "bright, motivated individuals to join our new billing services team as we enter the world of medical billing. "Our goal is to simplify the payment process by helping Epic organizations with the complexities of submitting claims and posting payments," the ad read. "Attention to detail is vital as you'll be posting payments and denials; reconciling payment files, claims, and statements; resolving posting errors; and calling payers to follow up on outstanding or unpaid claims." In November, Epic was hit with a False Claims Act suit that alleged the company's billing system double bills the government for anesthesia services. According to the suit that was made public last November, an alleged glitch in the system resulted in hundreds of millions of dollars of overbilling. The company responded that the plaintiff's suit stemmed from "a fundamental misunderstanding of how claims software works." Top executives at three electronic health record companies – Allscripts, Cerner and Epic – revealed in March 2017 they were working to make their EHRs more open, embracing APIs as a means to enable third-parties to write software and apps that run on their platforms. Epic, for its part, was working on two new versions of its EHR and developing Kit to go with its Caboodle data warehouse (as in Kit and Caboodle). CEO Judy Faulkner said Kit "is making everything very open." While early reports in mid-December about the planned $77 billion merger between CVS, an Epic customer, and Aetna focused on massive market share in the pharmacy and insurance realms, there was also the implicit promise of a new era in analytics, interoperability and population health. Alan Hutchison, Epic's vice president of population health, said that by using Epic's Care Everywhere and Share Everywhere interoperability tools, CVS and Aetna could provide the community with information and insights to improve care. At the end of January 2017, Epic Systems again landed the top spot for Overall Software Suite in the 2017 Best in KLAS: Software and Services report. The win marked the seventh consecutive year Epic took top honors in the report, draws from healthcare provider feedback. Epic also earned the top Overall Physician Practice Vendor and Best in KLAS awards in eight segments. What began as a straightforward software contract with Epic resulted in the U.S. Coast Guard starting its entire EHR acquisition process over some seven years after it began. EHR implementations are notorious budget-busters often fraught with missed deadlines and other unforeseen complications, but for an organization to abandon the project altogether and embark on a new beginning is uncommon. Indeed, this occurrence includes some finger-pointing from both sides. So, what exactly went wrong? Mayo Clinic hit a milestone this year with its $1.5 billion system-wide Epic implementation. The first 24 sites went live on July 8. The organizations said Epic will replace Mayo's existing three EHRs, which include rivals Cerner and GE Healthcare, as the hospital system's sole electronic health record platform.